This small manufacturing business gross margin percentage calculator will help you to estimate the gross margin percentage of typical jobs for use in the Financial Projections Template. If your business has multiple products then use the calculator for each type of production job and then average the margin using our weighted average gross margin calculator. The Excel sheet, available for download below, helps manufacturing businesses calculate the production gross margin percentage. The calculator is used by entering the number of units for the job followed by details of each type of cost. In particular, setup cost, direct materials, and direct labor, are entered both in quantity and rate terms. Factory overheads are allocated to the job at a predetermined rate based on the number of labor hours involved in setup and direct labor. Costs per unit are shown by way of information. On entering the unit selling price, the gross margin % and the markup % for the job are calculated for each production job. The manufacturing gross margin percentage calculator is available for download in Excel format by following the link below. Users use this manufacturing business plan template at their own risk. We make no warranty or representation as to its accuracy and we are covered by the terms of our legal disclaimer, which you are deemed to have read. 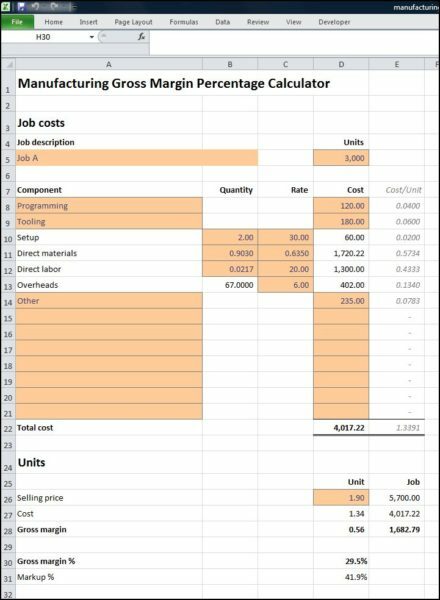 This is an example of a manufacturing product margin calculator format that you might use. It is purely illustrative. This is not intended to reflect general standards or targets for any particular company or sector. If you do spot a mistake in the gross margin for manufacturing company calculator, please let us know and we will try to fix it.